I noticed that some cameras upload very slowly via FTP. My Panasonic BL-C30 uploads only 1-2 images per minute, even though it captures snapshots every second. This creates a problem with timeline view. Snapshots date can go off by hours. Images captured at 2pm, show up like images at 3pm or even 4pm. There is a workaround. You can configure some cameras to include date-time into file name that gets uploaded. I added new advanced setting to help you extract this information. This setting is intended for power users. If you need help – shoot me email or submit feedback request. 4) Click on the “show” link for Advanced Settings. 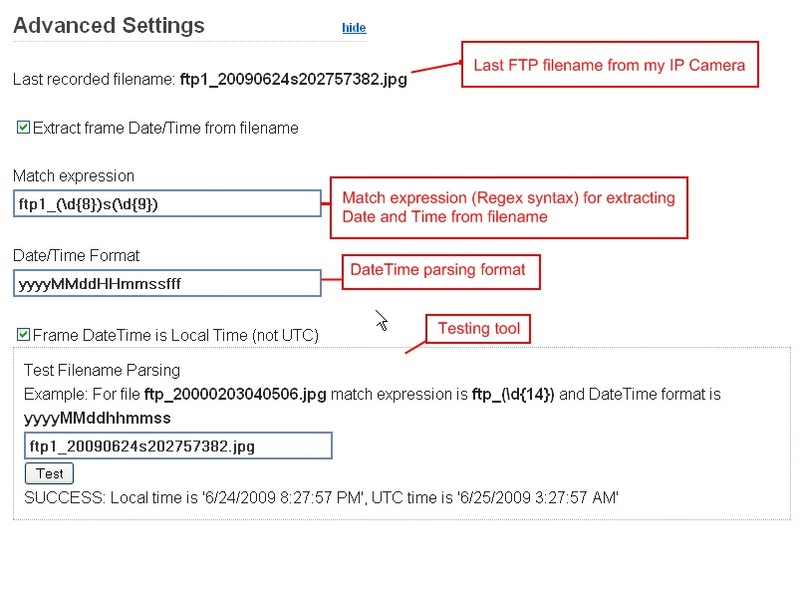 Now configure pattern to extract date-time part from file name and rules on how to convert extracted information into Hours/Minutes/Seconds. Lets say you configured Panasonic BL-C30 to upload FTP image with “ftp1_” prefix and you marked “Add filename” check box. Then your Date-Time extract settings should look like this.